The Ubud Writers & Readers Festival, which this year celebrates its 10th anniversary, brings together Indonesian, South East Asian and international voices. I spoke to Wayan Juniartha, Indonesian Program Manager. I wondered what she thought UWRF had achieved for Indonesian writers? “The Festival has played a major role in the birth of a new generation of promising Indonesian authors. Ours is the only literary festival dedicating significant resources to ensuring that emerging Indonesian writers, those producing quality work, but having limited or zero exposure at the national level, receive fair attention. Selected writers receive sponsorship to attend the Festival and the works they present are translated and published in our annual bilingual anthology, making their works accessible to English speakers. Since 2008 we have showcased 75 emerging Indonesian writers. This year more than 600 young writers from across the archipelago submitted applications to attend. The chance to speak alongside established authors, from Indonesia and elsewhere, provides chosen writers with valuable networking opportunities. Separately, we have established links with literary communities right across the archipelago; the Festival is now the primary bridge connecting Indonesian authors, particularly those living outside Java, with the international literary community." 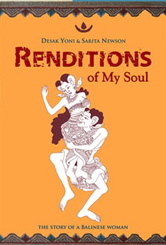 Renditions of My Soul, published by Saritasku Editions, certainly does sound interesting. Returning to Bali after years abroad, Desak Yoni experienced at first hand the multiple challenges facing Balinese women struggling in a patriarchal world. Renditions of My Soul, a fictionalized memoir that morphed into a novel, is apparently an antidote to consumer driven fantasies of Bali as a hedonist’s paradise, and as such it ought to be well worth reading. UWRF runs from 11 – 15 October. Visit www.ubudwritersfestival.com for more information.